Other destinations in Israel may also be available, please ask one of our Travel Specialists for more information. Please note: Advertised Sydney fares are via Bangkok & advertised Melbourne & Brisbane fares are via Hong Kong. Other stop over cities include Sydney via Johannesburg. El Al Israel Airlines do not fly from Australia so they fly codeshare with a variety of other airlines including Qantas. Stopovers permitted: Bangkok, Hong Kong or Johannesburg. El Al Israel Airlines flies between the stopover cities and Tel Aviv. 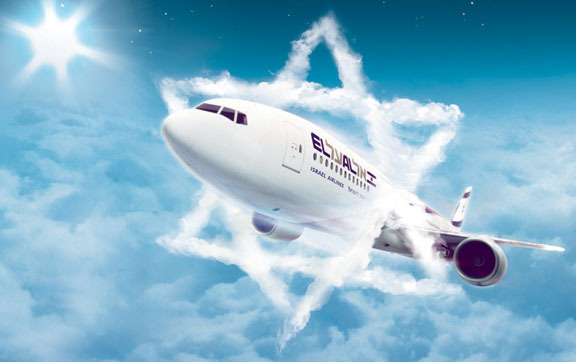 As the national airlines of the State of Israel, El AL Israel Airlines is committed to providing its travellers with the highest quality of service. At the same time they will afford you a service experiences that incorporates all that Israel has to offer along with that special feeling of home. We know that you would like to travel to your destination in maximum comfort. El Al Israel Airlines Business Class seats were planned and designed especially for you, to get you to your destination feeling as refreshed as at home. You are invited to stretch out and enjoy your flights to and from Europe on specially designed Business Class seats. Enjoy EL AL's bed-like seats on the 777-200 fleet, on four 747-400 aircraft and on some of the 767-300 plane. El Al Israel Airlines Business Class guests are invited to savor their rich and varied menu. The flight crew will be happy to tempt you with a choice of palate pleasing tastes during your flight, brought to you by EL AL's Chefs. We are pleased to serve you drinks from their international prize-winning bar. EL AL is proud to present its innovative and exciting wine list based exclusively on the finest Israeli wines. The varied drinks menu was created by Yair Haidu, an internationally known Israeli wine expert. wide selection of entertainment programs and other content. We invite you to experience the Dreamliner Business Class, allow the ultimate luxury experience to surround you and enjoy the warm personalized service from the Business Class crew, indulging you throughout the flight. This luxurious, spacious seat provides maximum comfort and privacy, with personal space, so that you can relax, work and enjoy sleeping on the full-flat bed seat. Get excited with us in Business Class as we redefine the concept of luxury. All seats have direct aisle access, and passengers can choose between two types of seats - single seats by the windows and double seats, which can be separated through a sliding divider. The seat opens to full-flat bed of two meters (78"/198 cm), providing comfort at the highest standard. The advanced seats were meticulously designed with ergonomic cushions for full support including your neck and back, providing maximum comfort throughout the flight. The Business Class menu offers a variety of meals made of the best ingredients, suited for both Israeli and international tastes, offering a selection of main courses served personally, at passengers` preferred time. In addition, passengers can choose an all-inclusive serving (express service), or order a light meal. Light snacks are served between meals. Passengers will enjoy a variety of alcoholic beverages and wines from the best Israeli wineries. Panasonic`s AVOD entertainment system offers a 16" HD personal touch screen, providing high-quality viewing experience. The entertainment system can also be operated through an advanced, easy-to-use interactive handset. Passengers can choose from 150 movies, 100 American and 250 Israeli TV series episodes, 200 music albums, audio books, games and tour guides. With such a wide variety of content, we believe you will always find something to enjoy. Whether you want to stretch out with a newspaper and snacks, enjoy a Shizan Spa treatment or finish up business matters before the flight, as Business Class passengers you are invited to enjoy the King David Lounge at Ben-Gurion Airport.